It's Facebook Fridays! for March 30, 2018, and we offer pure sweetness and wisdom to the world! 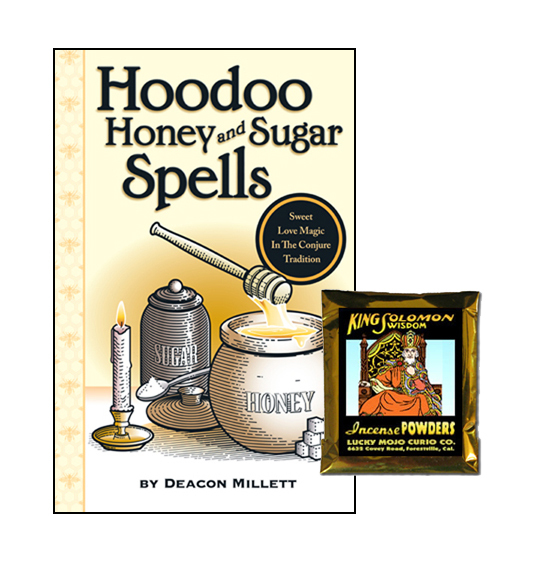 The Lucky Mojo Curio Company is holding a random drawing to give away 4 copies of Deacon Millett's "Hoodoo Honey and Sugar Spells" -- a compendium of folkloric magical spells for friendship, love, mediation, peace-making, and social harmony, along with a packet of hand-made Lucky Mojo brand King Solomon Wisdom Incense Powders, to enlighten and empower your cooperative engagement with lovers, co-workers, colleagues, and friends. Together we can make this a happier, more loving, and better world! First thing tomorrow morning, we will select FOUR winners at random, announce their names here, and ask them to message this Facebook Page with their mailing addresses, so we can send them their FREE Friendship and Empowerment products. We have a winner! In fact, we have 4 lucky winners! Our Facebook Fridays! winners for March 30, 2018 are: Evan Lionhart, Jacqueline Mathers, Valerie Rankin, and Randolph Carter.